Today, Obsidian Entertainment has shared a story on the official Skyforge website that explains some of the lore behind the upcoming fantasy MMORPG, including part of the planet Aelion’s history and the meaning behind the Skyforge logo, the Celestial Fortress. The story tells of how, in ancient times, an evil race of insectoid people known as the Mantides invaded the world of Aelion, where Skyforge takes place. Although repelled by the the immortals of Aelion including the planet’s god Aeli, the queen of the Mantides, Sangra, would stop at nothing to destroy Aelion. In an effort to destroy the planet, Sangra used her powers to launch one of Aelion’s own moons at the planet. As the moon came closer and closer to the Aelion on a path to destruction, all the peoples of Aelion and the great god Aeli banded together to create a device to stop the moon’s advancement, the Celestial Fortress. 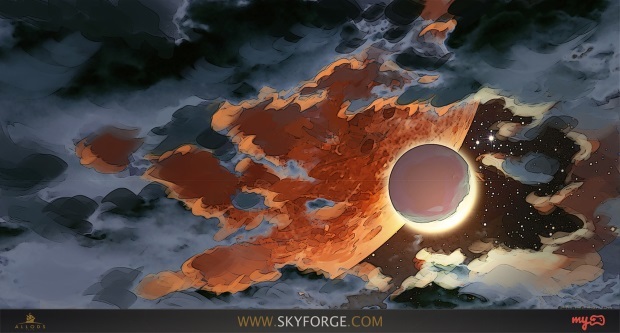 It is the image of the Celestial Fortress being launched into the sky against the backdrop of the twin moons of Aelion and saving the planet that is the logo for Skyforge and a symbol in the game that inspires the inhabitants of Aelion to great deeds and achievements. The League of Legends 2014 Worlds Final Championship is being held this weekend, at the Sangam Stadium in Seoul, Korea. Atari made a bold showing at PAX South 2016, showing off not one, not two, but three titles in the works. With the new update released today, colonists can now build crafting stations in their colonies for to create weapons and armor.